Rooney, the daughter of the late Andy Rooney and a broadcasting legend in her own right, will be stepping aside from “Greater Boston” on Monday though Thursday evenings next January. She’ll become a special correspondent and will continue to be involved in “Boston Public Radio” on WGBH Radio (89.7 FM). Rooney’s changing role will be a big loss for the city and the region. Since the late 1990s, she has been the face of WGBH locally, hosting not just her nightly program but also countless political debates and other events. And here’s a bit of trivia for you. When “Greater Boston” made its debut in 1997, it was strictly a four-day show. Friday evenings were taken up by a left-right political talk show hosted by former secretary of labor Robert Reich and former senator Alan Simpson called “The Long and the Short of It.” When that program ran its course, Emily was ready with an idea she’d been developing to hold the media to account. This is a huge change, although, thankfully, not for viewers of “Beat the Press” or for those of us who take part in it. I wish my very best to Emily. Below is the complete press release from WGBH. BOSTON, Mass. 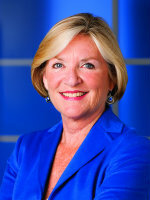 (May 29, 2014) — After hosting WGBH’s award-winning Greater Boston for 18 years and working the daily grind in newsrooms at WCVB, ABC and FOX for 25 years before that, Emily Rooney has decided to step back from her daily newsroom and Greater Boston hosting duties to focus on the weekly Beat the Press program. In addition to moderating Beat the Press, Rooney will move into a role in January as a Special Correspondent to WGBH News and will continue to appear regularly on 89.7 WGBH’s Boston Public Radio. Over the years, Rooney has cultivated a loyal viewership, producing the last remaining daily broadcast in-depth talk show in the city attracting local and national dignitaries and everyday people to a community roundtable of ideas and hot-button topics. Under Rooney’s leadership in the WGBH newsroom, Greater Boston and Beat the Press have won a number of awards, including Regional Edward R. Murrow broadcast awards and New England Emmy Awards. Beat the Press is a five-time winner of the National Press Club’s Arthur Rowse Award for Media Criticism. Last week Beat the Press picked up Penn State’s Bart Richards Award for Media Criticism for coverage of the Boston Marathon bombings among other issues. Rooney herself has been honored with the Dennis Kauff Award for Excellence in Reporting, Reporter of the Year from the Massachusetts Bar Association, and the Yankee Quill Award from the American Newspaper Society. She was recently inducted into the Massachusetts Broadcasters Hall of Fame. Before joining WGBH, Rooney was director of political coverage and special events at FOX Network in New York. Prior to that, she was executive producer of ABC World News Tonight with Peter Jennings. She worked at WCVB-TV in Boston from 1979-1993, including three years as the local ABC affiliate’s news director. In recent years, the WGBH News division has expanded from the strong foundation laid by Rooney and the Greater Boston production. The entire newsroom works collaboratively across all electronic platforms — television, radio and digital. In addition to Greater Boston and Beat the Press, WGBH News produces the weekly television program Basic Black for WGBH 2, as well as Boston Public Radio, Innovation Hub and Under the Radar with Callie Crossley for 89.7 WGBH. It is also a co-producer of The Takeaway and The World radio programs. In the coming months, Redo will consider options for filling Rooney’s role on Greater Boston.